We have all had "Auntie's" who are no relation. I've had many - Auntie Enid, Auntie Doris, Auntie Nancy to name but a few. Friends Dorothy and Keith had an "Aunt" Peggy. 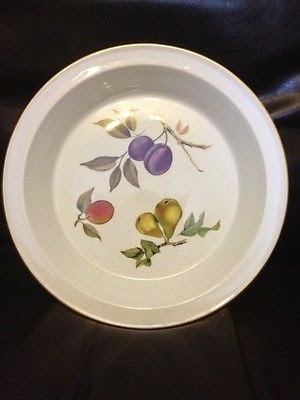 Peggy died a few months ago and when Dorothy and Keith were sorting/clearing the house they kindly gave me some of Peggy's baking stuff including this lovely Royal Worcester Pie dish. They also gave me lots of baking tins which I have put to good use. Peggy was a WI member and avid baker, whilst I have never been much of a baker I must admit I have discovered the joy of baking cakes and I am sure part of it is down to wanting to ensure that Peggy's baking legacy lives on. Keith and Dorothy were very kind and donated lots of Peggy's baking items to the village hall. 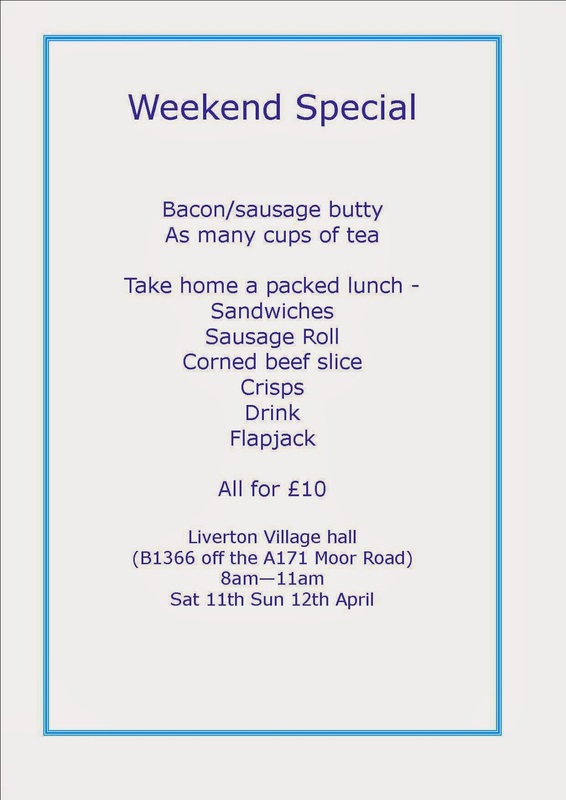 To keep the memory of Peggy alive each month when we have our coffee morning/lunch we will have a "Peggy's Pie Special" the coming May event will feature an Apple Pie. For inspiration the girls on the library van found this book for me so I am currently reading through and getting some ideas. 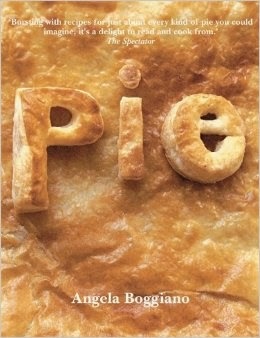 There is a very interesting recipe - with cheese pastry! Apple pie without the cheese is like a kiss without a squeeze. This is an old Saxon proverb and they certainly knew what they were talking about. This pure apple pie is complemented by the best ever pastry. The old combination of cheese and apple makes absolute sense and, believe me, is wonderful. Use Cox's or Braeburn apples for flavor and because they hold their shape and a good cooking apple to make the delicious sauce. Place the flour in a large mixing bowl, make a well in the center and tip in the sugar. Add the butter and use your fingertips to rub it into the flour and sugar until the mixture resembles fine breadcrumbs. Stir in the egg yolks and cheese, adding a little water if the mixture seems too dry. Use your hands to form the mixture into a smooth dough. Wrap the dough in plastic wrap and chill for 20 minutes. Place the apples in a saucepan with the sugar, lemon juice, and 2 tbsp water and cook for about 15 minutes until softened. Leave to cool. Preheat the oven to 375 degrees F. Place a sturdy baking sheet in the oven to heat. Rollout two-thirds of the pastry to 1/4in/5mm thick to fit a 9in/23cm pie pan or plate. Fill with the cooled apple mixture. Rollout the remaining pastry to make the lid, brush the edges of the pastry shell with water and top with the lid, pressing down to seal. Trim with a knife to make a neat edge and crimp the edges with your fingertips, if you like, make a hole in the top of the pastry and dust with superfine sugar. Place on the baking sheet and bake for 25-30 minutes until golden. Leave to stand for about 15 minutes before cutting into wedges and serving with cream. P is for Peggy - ABC Wednesday. Bev is now out and about with Mabel and Olwyn. 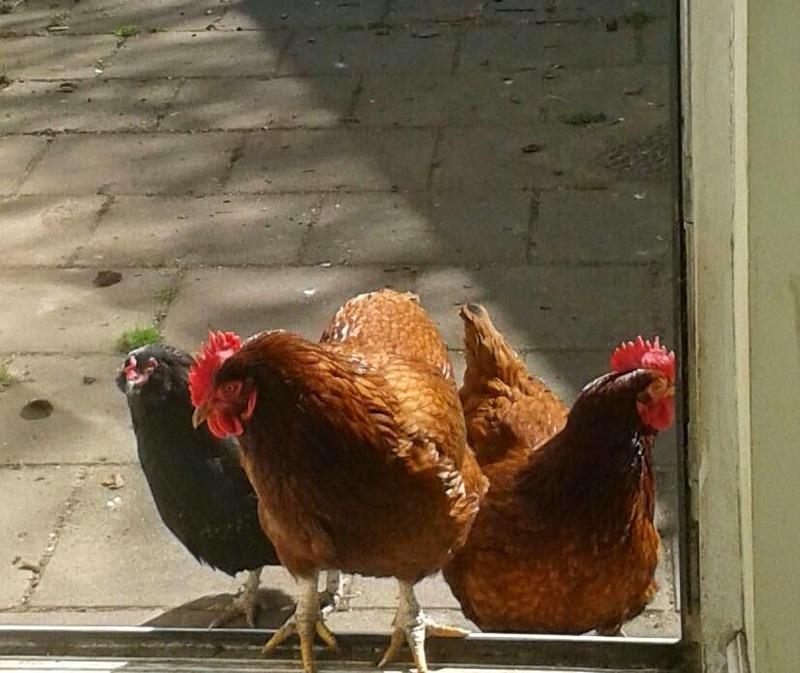 Here they are earlier today on the kitchen doorstep waiting for their 10 o'clocks. They are currently partial to red grapes. After a baking session I saved all the left over pastry bits and served it for tea - they loved it. 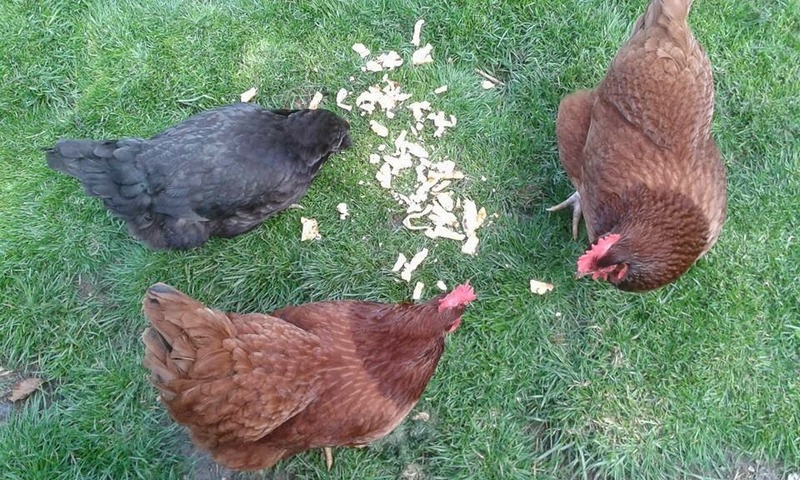 It is lovely to capture the hens in their daily activities. 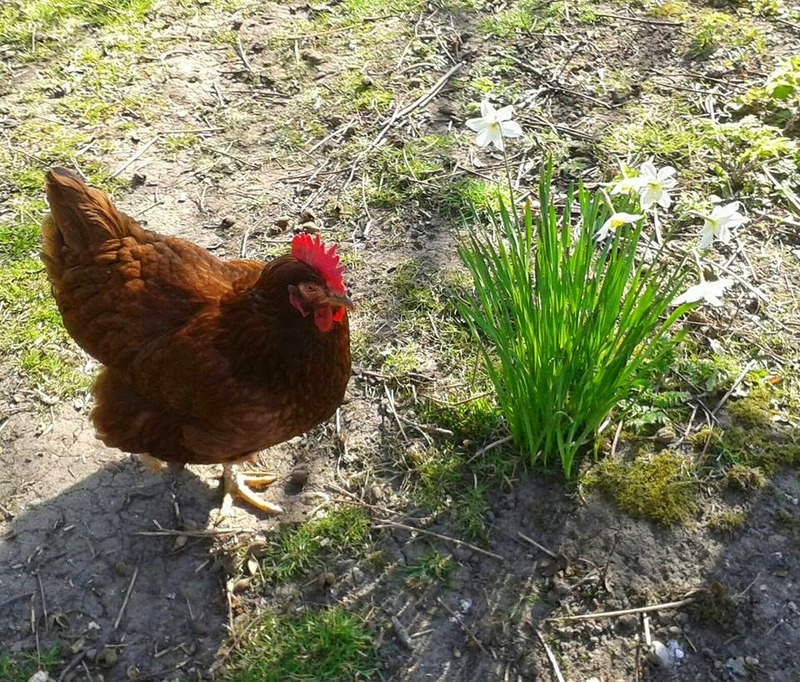 Mabel does enjoy looking at the flowers - no she doesn't eat them. 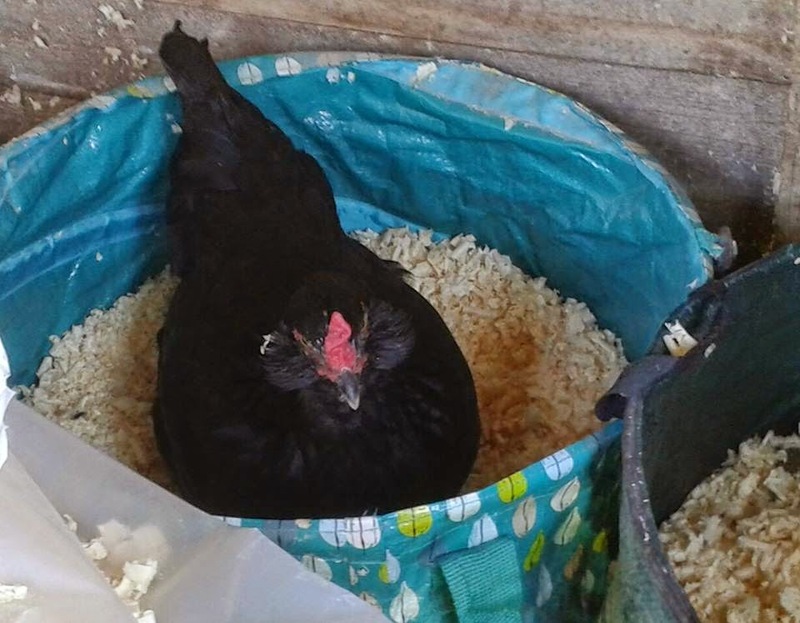 A couple of days ago Bev made her way to the henhouse and laid an egg - a good indication she is well and truly over her ordeal. 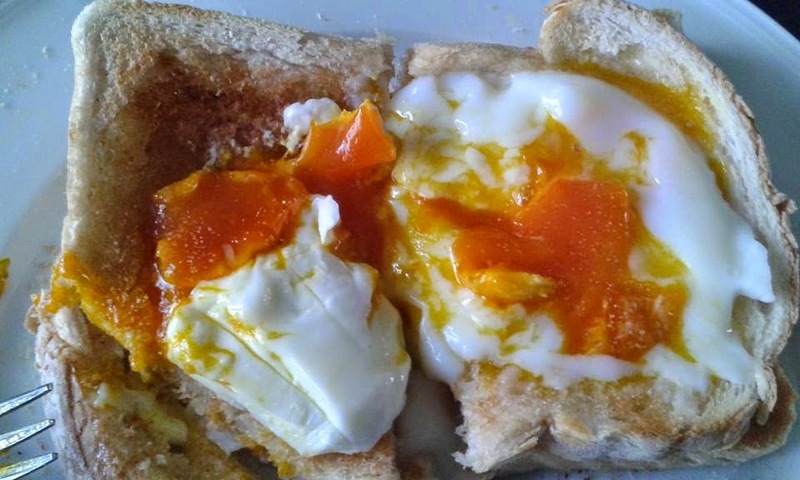 The eggs from Bev are out of this world! Over the moon indeed. ABC Wednesday. I have been so busy organising and baking for our village hall events of late, hence my lack of blogging. The Biker's initiative is a new idea. 3 times a year the Oliver's Mount Racing Circuit in Scarborough holds racing weekends over Saturday and Sunday. The road leading to our village is off one of the main roads to Scarborough, the A171. Many bikes pass the end of our road. The prices are quite steep and the food stalls are limited choice (mostly pies and burgers) but pricey. My partner in crime, Karen and I decided we would try something new and hatched a plan. We used facebook to advertise the information. We also used an old wheelbarrow as an advertisement on the main Moor Road to Scarborough. There are strict rules re using signposts to advertise - but this method is mobile and therefore within the law. The venture was new because we had to buy raw ingredients (bacon, sausage, bread) which would incur costs and there was the question of what to do with them if not sold. The weather has been dreadful but despite the odds been stacked against us the bikers came, not in their hundreds, but they came and after expenses we made a profit of £138. 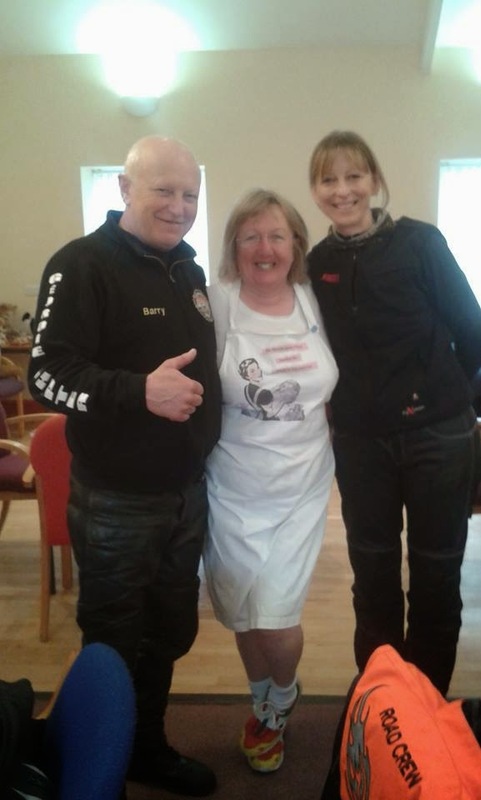 It was great to catch up with some dear old friends Barry and Trish will bring their fellow bike mates to the next event - Barry is the leader of the group and will pass the word. The bread left over (fresh rolls made by our local baker and delivered on Saturday morning) is now in the freezer and will be used up when we serve soup at our next coffee morning/lunch. A local farmer gave us a carrier of leeks which I blanched and froze - the next soup will be leek and potato.There is also a pack of sausages left over - again in the freezer which I will make into scotch eggs, again for the next time. I made some corned beef slices - these are now frozen and will be offered with a salad for the lunchtime menu. 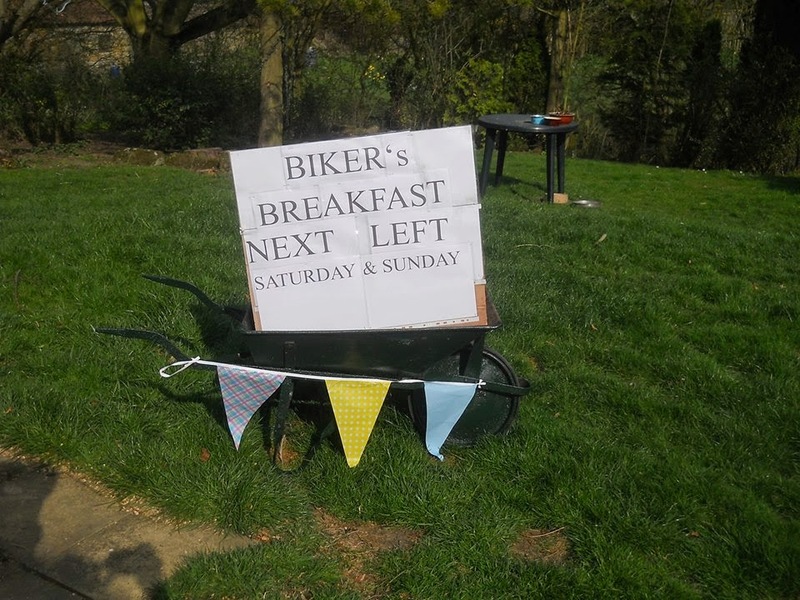 Our next coffee morning will incorporate a plant stall but it is 6 weeks away.......and now we have our wheelbarrow we are thinking........May Bank Holiday weekend??????? ABC Wednesday - M for money and N for new!